Today is week 40 and we are playing along with Powder Pink one of the In Colors for 2017-2019. Powder Pink is a favourite colour of mine and it will be retiring soon as of the 31st of May 2019. I decided to use this colour with Basic Black and Whisper White. Using lots of different layers and mediums with Stampin' Up! products. I decided I just had to use the Sale-A-bration free item Country Floral Dynamic Textured Embossing Folder. It's so beautiful with the raised textures of flowers and foliage on the Cardstock, I think it's a must have for any crafter. The best thing is it's free with any purchase of $90 until the 31st of March 2019. I used the largest Rectangle Stitched Framelit to die cut the Cardstock and I sponged with a Dauber using the Frost White Shimmer Paint to highlight the flowers and foliage. The Stitched Labels Framelits from the Annual Catalogue was used in Powder Pink, Black Foil Sheets and Whisper White. I embossed the greeting in Black Stampin' Eboss Powder. The greeting is from the beautiful stamp set Ribbon Of Courage. To finish off the card I wanted to use the Mini Ruffled Ribbon in Powder Pink this is so pretty, plus I used the Mini Sequin Trim in Black and Polka Dot Tulle Ribbon in Whisper White. I tied the three of them around the card together. 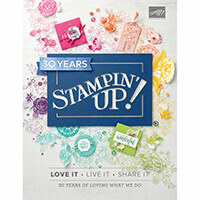 Tools & Accessories: Country Floral Dynamic TIEF, Rectangle Stitched Framelits Dies, Stitched Labels Framelits, Black Stampin' Emboss Powder, Embossing Buddy, Sponge Dauber, Shimmer Paint Frost White and Metallics Sequin Assortment. Beautiful card Vicki! Yes that Country Floral folder is a must have in my book too. Powder Pink looks great with Early Espresso. Great to have you along on the hops. Thanks Claire. Looking forward to participating in many more. Thank you so much Rachel. Shimmer paint just adds a little sparkle to the card. Thank you Cathy it was my pleasure. Looking forward to more blog hops with you. what a lovely card Vicki, I love all the layers and textures. Thank you Diane. I really enjoyed making this card. Wow Vicki, so inspirational! I truly admire your ability to use all those layers and textures and still produce such a stunning card. Can't wait to see all your other creations. Thank you Tania. I love to creature with different types of mediums and layers. It was so much fun! Love all your layers, textures and embellishments. A real wow card, well done! So pretty, Vicki! The pops of black look amazing, and the card retains it's femininity. Awesome card! Thank you so much Tina. I was very happy how my card turned out.